Oregunsmithing, LLC is located in Pendleton, OR. Wayne York, the owner, has over 45 years of experience in gunsmithing. Wayne is a retired Oregon State Trooper. He was a gunsmith prior to his police career and continued it as a hobby during his career. Following retirement in 1999, he again became a full time gunmaker/gunsmith. Wayne shot competitively in Police Combat Shooting for many years and holds several state records and is co-holder of three national records. He is also an avid hunter and sportsman. Wayne builds custom rifles, handguns and manufactures Pendleton Composite Stocks. He provides custom services on rifles, handguns and shotguns. He is one of approximately six in the United States who offer reboring rifle barrel services. He also does relining. He has built many types of rifles, including tactical/target, sporting, and his specialty ultra-light rifles. 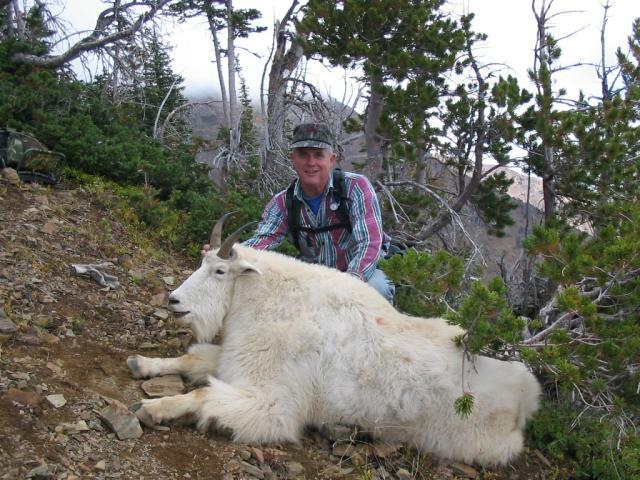 This is Wayne York with his once in a lifetime Rocky Mountain Goat. Taken on September 11, 2005 by Wayne at the 8,350 ft level in the Wallowa Mountains of Northeast Oregon. Wayne used one of his custom ultra-light rifles, chambered in .338-06 Improved, with a 210 gr Hornaday Interlock. One shot downhill at 150 yards. The goat was scored at around 49. Horns measured over 10 inches in length. Many low pressure barrels can be relined to the original caliber, thus keeping the outside original. No high pressure, stepped liners, or chamber bushings will be installed. This Boone and Crocket antelope was taken in 2013 near Douglas, WY. The horns are unique, since they make a full circle and touch at the top. It scored over 81. Taken with my lightweight Sako 75 chambered in 25 York at 200 yards.